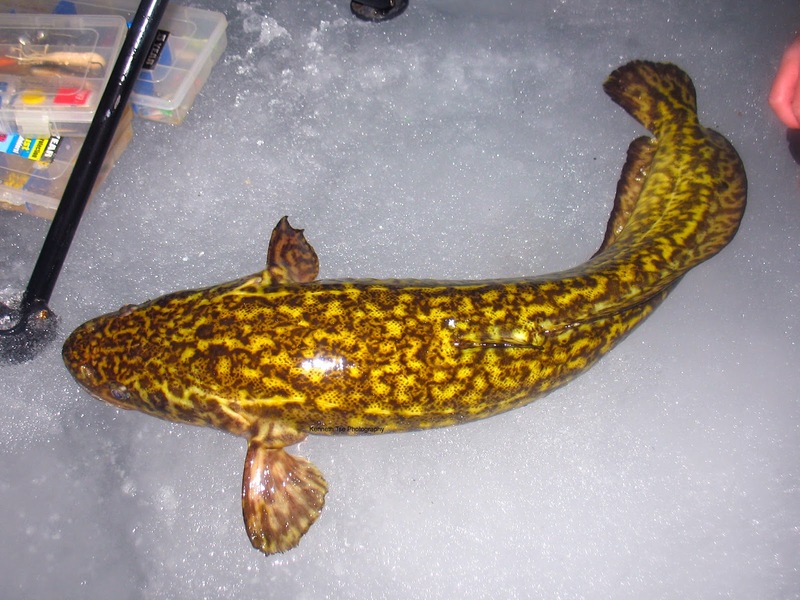 The Burbot, a freshwater cousin to the well known Atlantic Cod, is a fish that not many people targeted. Often describe as eel-like, slimy, stinky and ugly, these fish get a bad reputation that they really don't deserve. 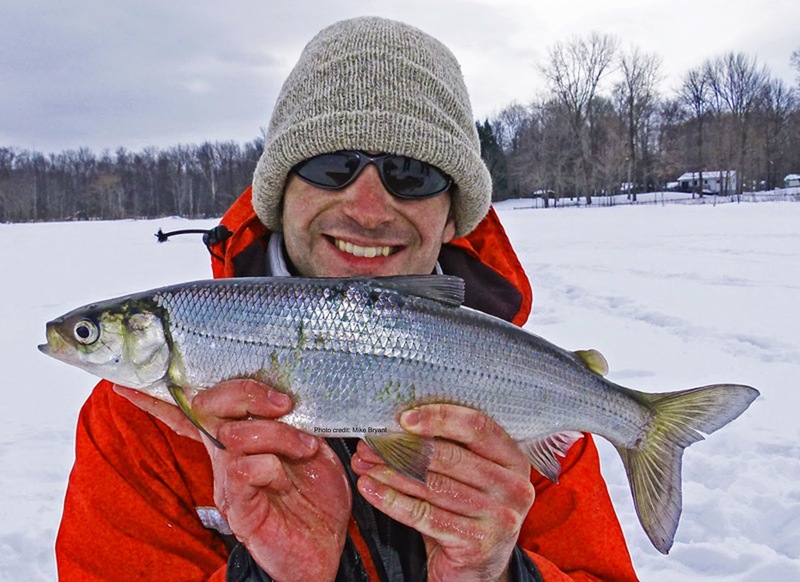 They are one of the harder fighting fish that you can find while icefishing, and if you can find a spawning aggregation, you can be sure of some fast action. However, finding one of these spawning aggregation requires fine tuning to time their all too short spawning period of 2-3 weeks, and their spawning sites can be very elusive on a big expanse of water. There are simple too many potential shallow areas where they could spawn, but only the Burbot knows why a certain site is chosen. 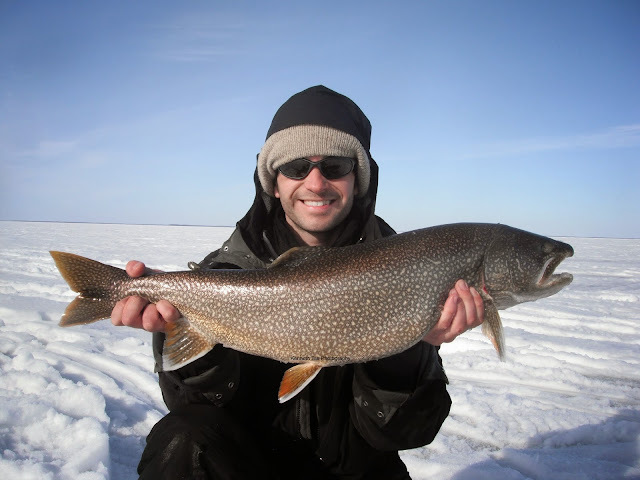 After our most consistent Burbot lake was closed to protect the Lake Trout population (it is so freaking stupid! 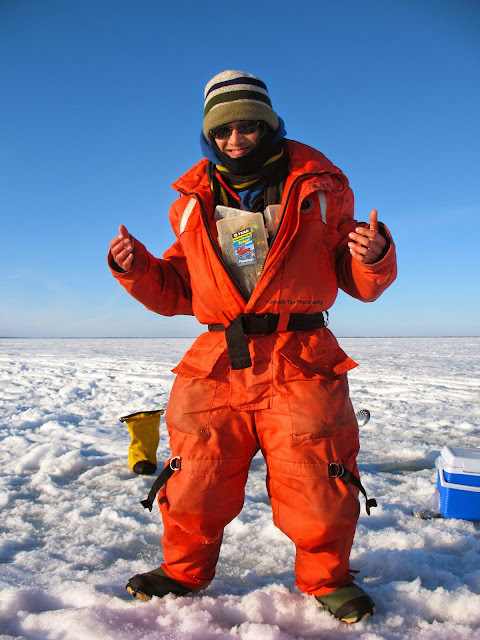 ), Michael set out to search for Burbot on Lake Simcoe. A friend of mine had caught 10 giant Burbot on Simcoe back in 2010, but details were scant and consistency hasn't been achieved. 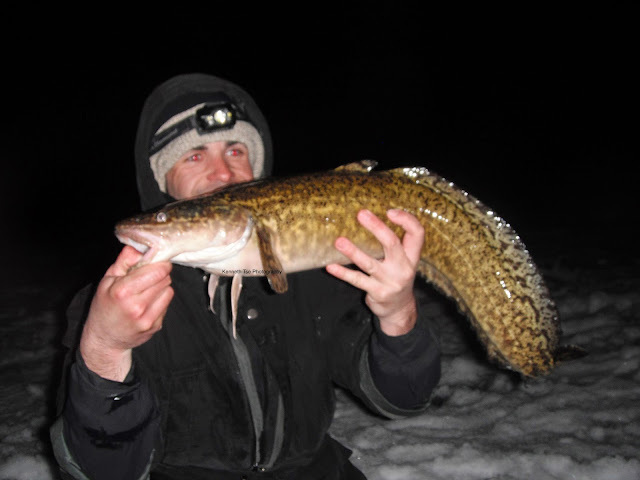 While search somewhere in the middle of nowhere on Lake Simcoe, Michael caught Burbot on two separate nights recently. Simply finding one Burbot on Lake Simcoe was rare enough, but finding them on back to back try on the big lake was impressive. It's like finding Sasquatch on back to back tries. He asked if I was interested in joining him in the hunt. Seeing it was March Break for me, we planned to spend two nights on Lady Simcoe to hunt for that elusive Simcoe Sasquatch. 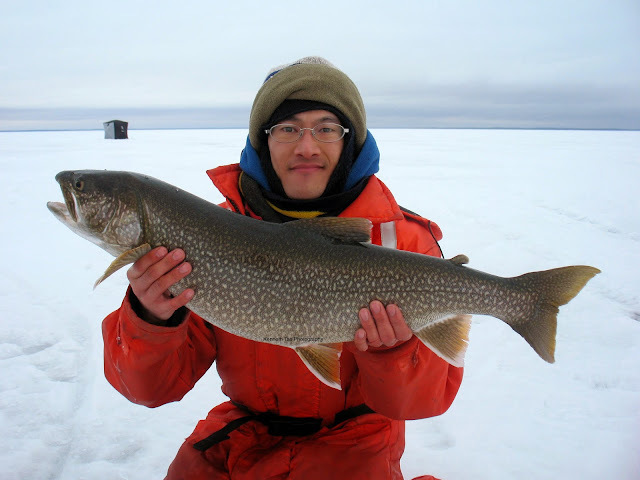 On Saturday morning, we set out early hoping to spend the day exploring the mid lake area for Lake Whitefish and Lake Trout, while trying to narrow down potential areas to fish for Burbot at night. Since we were spending two nights out on the ice in our portable shelter, we need to ensure we pack well for the trip. At 15km from the launch, it is a pretty high risk trip should anything went wrong in the middle of the night. Even with lots of gear, I am the reigning Tetris Master when it comes to packing. We had everything fit inside Michael's flip style shelter and ready to go. Our 15km ride to our location was quite treacherous. It was warm and drizzly, leading to significant snow melt and slushy conditions. 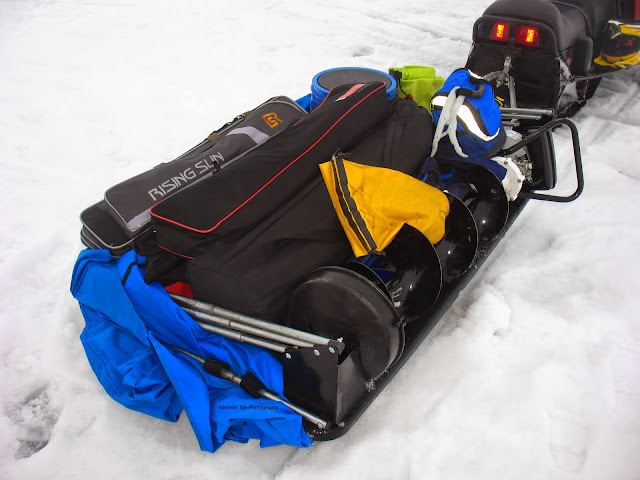 We had to travel slowly and carefully on the snowmobile so as not to get stuck. Area without snow was often littered with jagged ice that was difficult on the tracks and we were bounced around a bit. Cautiously, we made it to our spot with all the gear in tow and alive. The first day of fishing turned out very slow. Using the Navionics map on my phone, we checked various spots to find very little happening. Our best spot of the way was the tip of a flat top point in 71 feet of water where we found a few suspected Lake Whitefish and both Michael and I got one tap from a passing school. With a lot of running and gunning, time passed quickly and before long, it was time to set up base camp. While we were setting up for the evening, we met my buddy who caught those 10 Burbot one day in 2010. After a good chat, he wished us luck and we started chumming the area. We were told by another friend that chumming is the key...and we really chummed the heck out of the area. As the sun set, it became progressively gusty. In fact, our plan to explore various spots after dark was scrapped in favour to hunkering down at camp. Starting around 7pm, we marked some fish tight to the bottom that would linger around a bit. They looked exactly like Burbot marks, but these fish would not bite at all. Around 8pm, after not marking any fish for a while, I was just jigging away trying to attract any fish while I felt a tap and a fish on the line. This fish gave up more fight than a Burbot normally would and we were expecting a Lake Trout when a Burbot came up the hole! This fish must have been hugging bottom since I didn't even mark anything at all. I don't know how anyone can call these fish ugly. They have such a unique and beautiful pattern on the body. A beautiful fish deserves more photo space. After this fish, we got excited to know we were in the right area. In fact, this was the same spot where Michael caught two of them in the recent week, so there appears to be a bit of consistency. With hopes high as ever, we fished more intently throughout the night, but fell flat on our faces. I was jigging past 12am until I was too tired to continue fishing. Just before I turned the lights out, I lowered a couple of very lively minnows to fish while I slept. When I woke in the morning, they were still as alive as ever...and untouched. Michael also said he saw no activities and zero marks on the sonar. It was a bit defeating after having landed one from the spot. The night was interested since it was so cold and gusty. I woke up cold at 3am since my heater wasn't strong enough to heat the entire shelter. In the end, I survived by putting the heater behind my camping chair so my back and core would be exposed to the warmth from the back side, as opposed to having the heater at my feet pointed toward my front side. Michael tried to shrink down his flip hut but it was much too windy for his hut to stay intact when collapsed into a smaller size. Neither of us really had much sleep at all. With us up and early in the morning, and seeing only a couple of marks at our base camp, we decided to make a small move to fish another just 90 metres away. It didn't take long before we were marking a few fish. Soon, one fish took my Bad Boyz jig and I was into a good battle. 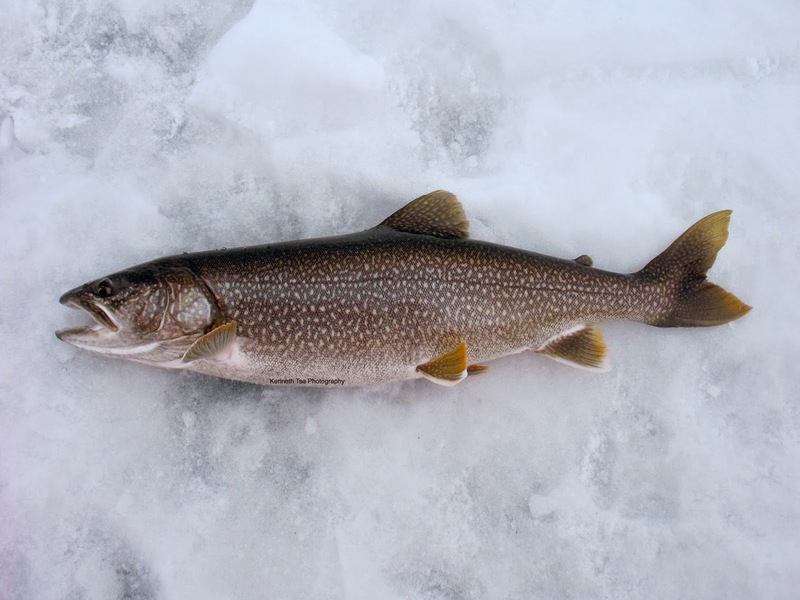 It was pretty obvious that we have a Lake Trout on the line. Fish always knew to bite when you were the most inconvenienced. 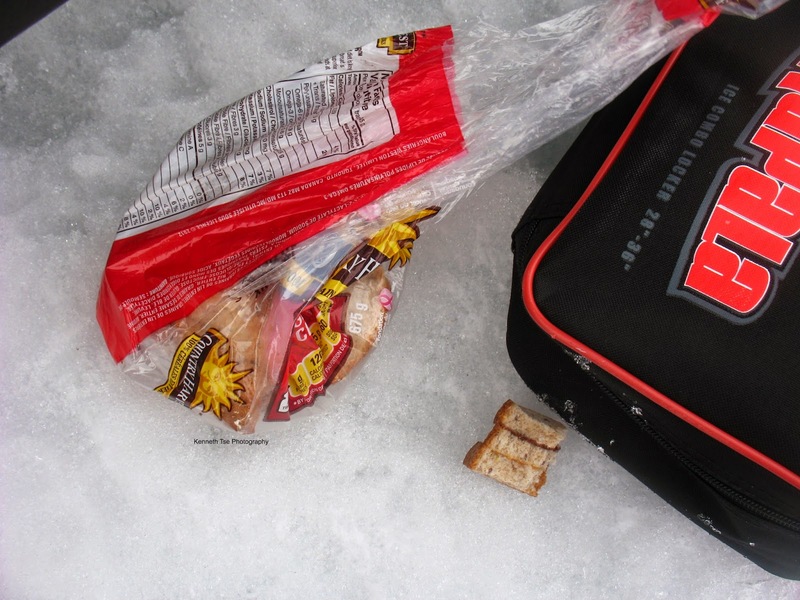 In this case, I was just having my breakfast sandwich when the Lake Trout hit...and my sandwich ended up tossed on the ice. That's OK. I would get rid of my sandwich any day for a fish on the line! We thought it would be a decent spot to spend more time, but soon we had blank screens after blank screens. Absolutely nothing was happening. It was still a bit gusty so we decided to head back to base camp and fished from the shelters. Around mid afternoon, our nearby neighbours that had set up shop about 100 metres from us came for a visit. They said they had been on fish all morning and they had two free holes for us to try. Michael and I decided to pack light and simply walk over to the spot. I took only one rod, my sonar and three tackle trays. This is where I store tackle trays when I'm traveling light. Our neighbours were using pinhead shiners and they had been chumming massive amounts of shiners to attract and hold the fish at their location. Michael had wanted to bring some pinheads but his local bait shop was out of them. Our friendly neighbour shared some of his bait with us and on the first drop, Michael hooked a Lake Trout! We thought it would be on fire from there onwards, but after getting only a couple more lookers on the screen, we were back to staring at blank screens. We didn't have enough shiners to chum and apparently chumming was the key. As such, we had no further success even when we were only 50 feet from our neighbours. When it was close to 6pm, Michael and I decided to start chumming our base camp again to prepare for our second night of Burbot fishing. 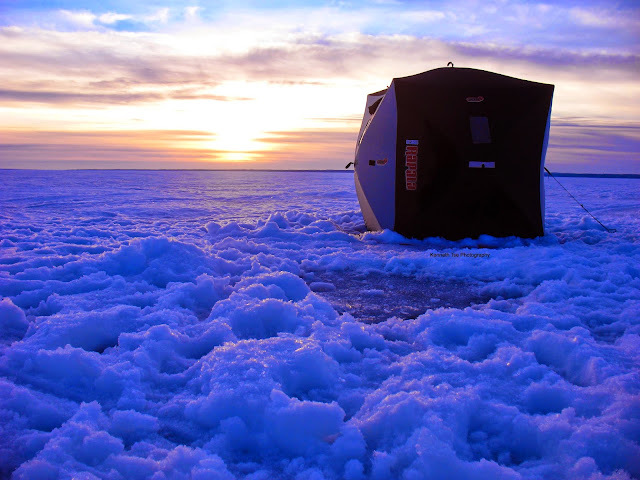 We had a beautiful calm evening and the sun was setting on the last day of the icefishing season for Lake Trout and Lake Whitefish on Lake Simcoe. It was tremendously sad that I was only able to fish this lake for 3 days this winter. Seeing this last sunset was a bit moving. Close to dark, we again saw some fish on the bottom that resembled Burbot marks but none would bite. Once dark, the screens were blank again and all was quiet. Once our neighbours packed up, with their limits of Lake Trout plus 3 Lake Whitefish, we decided to try their location for Burbot. About 15 minutes after we started fishing their spot, a Burbot moved in and took a liking to Michael's lure. Expecting more action to occur, we stayed at the spot until 11pm but nothing else transpired. It was late and we were tired, so we once again sent down a couple of lively minnows to the bottom before turning the lights off. On this second night, it was calm and warm. I remember shutting my eyes around 12am and opened them at 5am like no time had passed. Since the season for Lake Trout and Lake Whitefish had closed already at 12am, I did a bit of casual searching for Burbot early in the morning before we deciding to pack it up at 8am. Our return trip was a bit easier since the cold snap at night tightened all the slush. Travel was much easier but still required caution and slow speed. 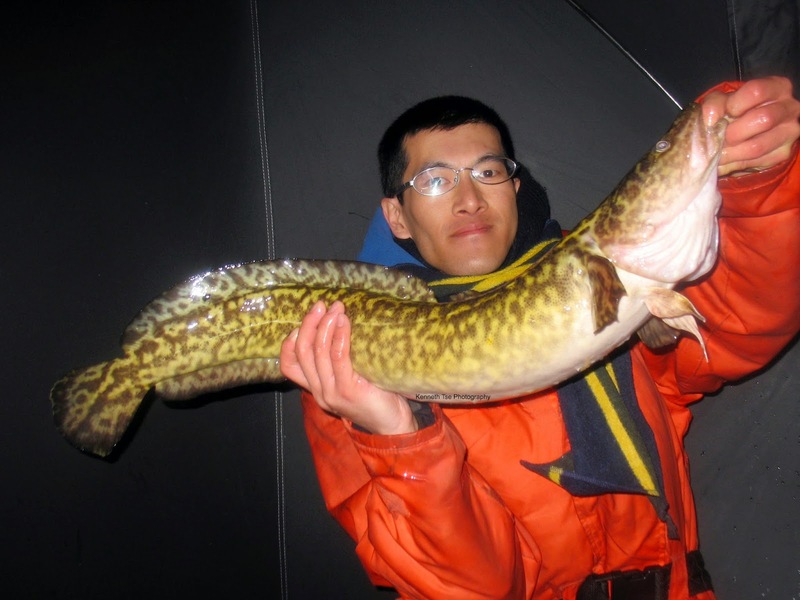 We were just glad to make it back to our launch with a couple of Burbot under our belt. 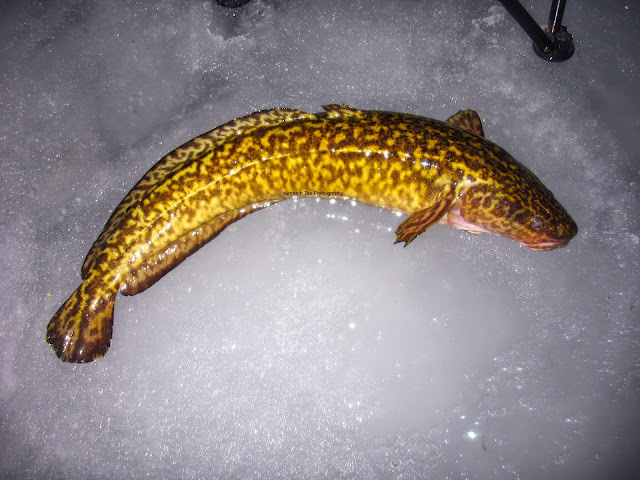 Next year, we plan to start searching earlier in hopes of finding that one holy grail...a major spawning aggregation of Burbot on Lake Simcoe. I don't know if many younger readers know the concept of pen pals. Not too far back in the past, people often write to strangers across the ocean. Sometimes, these strangers eventually became persons who you would share many details of your life through letters and post cards. They could even turn into your best friend or soul mate, yet you might have never met them in person. With the popularity of online forums today, letters are not written anymore, but pen pals (aka forum friends) exist. I have many of them and enjoy our conversations mostly focused on fishing. Many of them I have never met in person. Mike was one such pen pal of mine. We chat over emails and Facebook a bit about fishing in Yellowknife where he lives, and I've been waiting for the opportunity to share with him some of the fishing opportunities here in Toronto. He does visit my area often since he has family in southern Ontario, but we've yet to find a mutually available time to meet. Strangely, our first time meeting was neither in Toronto nor Yellowknife. It was on a tiny lake in upstate New York. On his flight back from Florida, Mike stopped in Ottawa to visit his brother Corey. 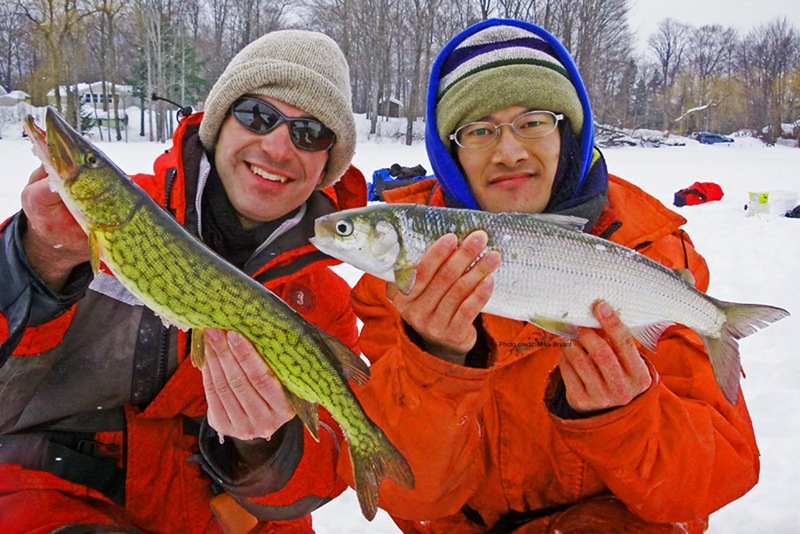 Our mutual friend Eli found a sweet little lake full of Chain Pickerel in New York. Mike wanted to add a new Esox species to his list for a while...so in short order we decided to converge on this lake to help Mike catch his lifer Chain Pickerel. Michael and I were tasked to get bait the night before and to set up base camp early in the morning, since we had planned to drive to New York on Friday evening and get some good sleep for the night. A friendly bait shop owner agreed to scoop out a couple dozen of mixed minnows and set them hidden outside the store so we can retrieve them by the time his store has closed. Getting the bait wasn't an issue...keeping them climatized at almost freezing temperature was an issue in our overly heated hotel room. 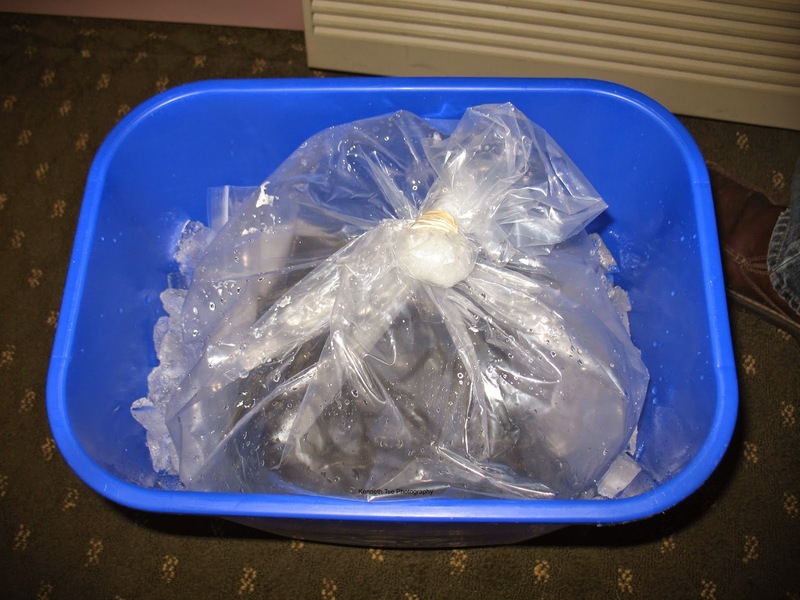 Our solution was this...ice machine...plus a plastic recycling bin...and the opened window. The minnows survived the night with hardly any lost...and we survived the night without being roasted. The next morning, Michael and I arrived at the lake by 8am. Our goal was to find a weedline where Eli had suggested. I was too busy to look up too much information on the lake aside from satellite photos. We really don't know how fast and deep this weedline would end. Using Michael's power auger, we quickly went to work to understand this structure. Our first hole ended up set over 6 feet of water with some weeds on the bottom, but the water was mucky and smelled of badly decayed matter. We backed off the bay a bit to find some cleaner water, and soon found the steep dropping weedline that went from 2 feet to 12 feet within a reach of 15-20 feet. I guess that's what we were after! Just as we finished peppering the area with 10-inch holes ready to fish, the rest of the gang showed up. After a quick hello to Mike, Corey and Eli, everyone got to work. 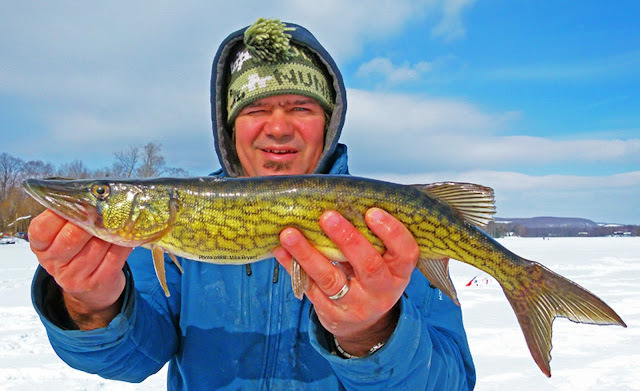 It took all of 15 minutes before Mike landed his first Chain Pickerel on a minnow and jighead. He was using Eli's Marcum and saw a fish appeared on the screen before taking this fish. Michael was working a Shad Rap when he saw a suspended fish on his screen. After a longer than expected fight, we saw a silvery side that completely stumped us. 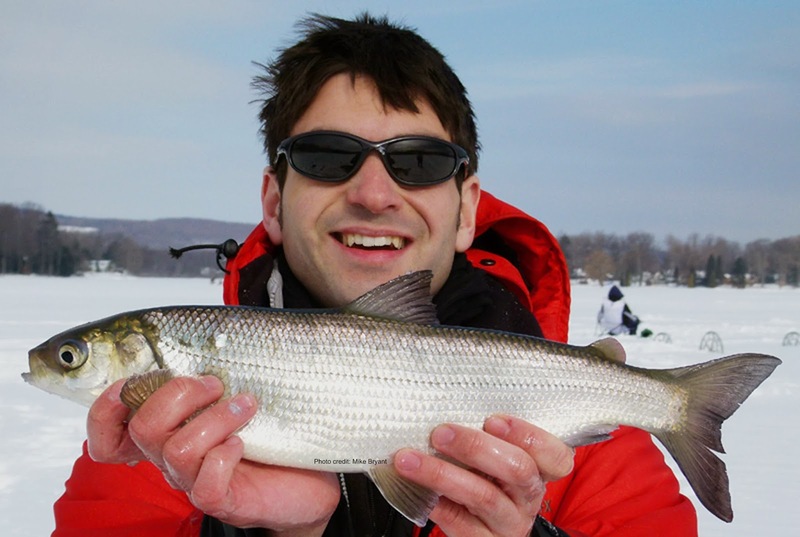 At first, the tall back of the fish suggested Lake Whitefish, but a closer examination revealed it was a giant Cisco! You got to understand this...we were fishing a lake that was only 35 feet at the deepest. The majority of this lake average 12 feet except for one small but deep hole. There were few feeder creeks into the lake that can cool the water in the summer. In fact, Eli said this lake was completely weed choked and he can't understand how a Cisco, a coldwater fish, can even survive, nevermind growing to such giant size. We thought it was a huge freak of nature and returned to Chain Pickerel fishing, not expecting to catch another one again. Finally, one of my set lines was tripped and I had a little pickerel taking a bit of line. I asked if Corey wanted to take this fish since he has never caught one before. Corey didn't want it but Mike wished to have a second experience with the pickerel. 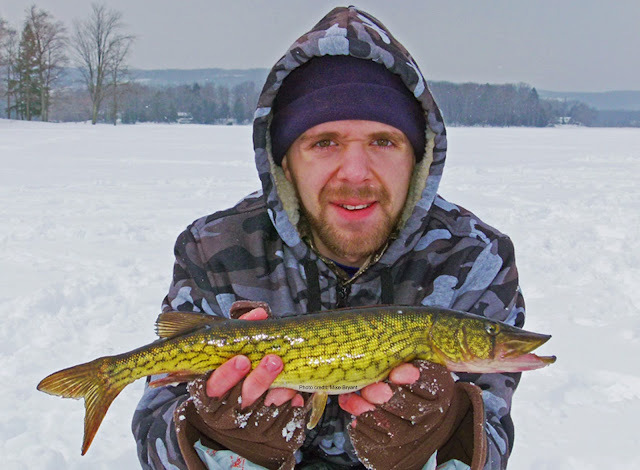 Soon, another nice Chain Pickerel came up the hole. Fishing started to slow after 11am. I managed to have a couple more hit and miss. All of a sudden, there was commotion again and Michael found another Cisco! Now everyone went to work to catch one of these giant Cisco that were not supposed to survive in this lake. Mike caught a bunch of small Yellow Perch and a little Largemouth Bass out in 15 feet of water, while Michael and I remained to fish at 12 feet of water. We were expecting one more person to arrive. He is known as krazyk on the internet forum. I don't know him at all, but Eli had invited him to join us for Chain Pickerel fishing. When Ethan (krazyk) finally arrives, he explained that this was only his second year fishing and he had been trying to catch a Chain Pickerel through the ice. He had no success so far except for stolen minnows. I made a point to help him catch his first Chain Pickerel if I get another hit again. Around 2pm, the weather changed from overcast to sunny. That little change spurred a little activity as my set lines were tripped a few more times but fish would always dropped the bait before I can get to it. Switching one rod over to jigging, I soon saw three suspended marked on screen. As I reeled the Shad Rap up to the bottom fish, I felt a tap and hooked it. At almost the instant moment, Michael was hooked up too. What came out of our holes were probably the most ridiculous double header all of us had ever seen. 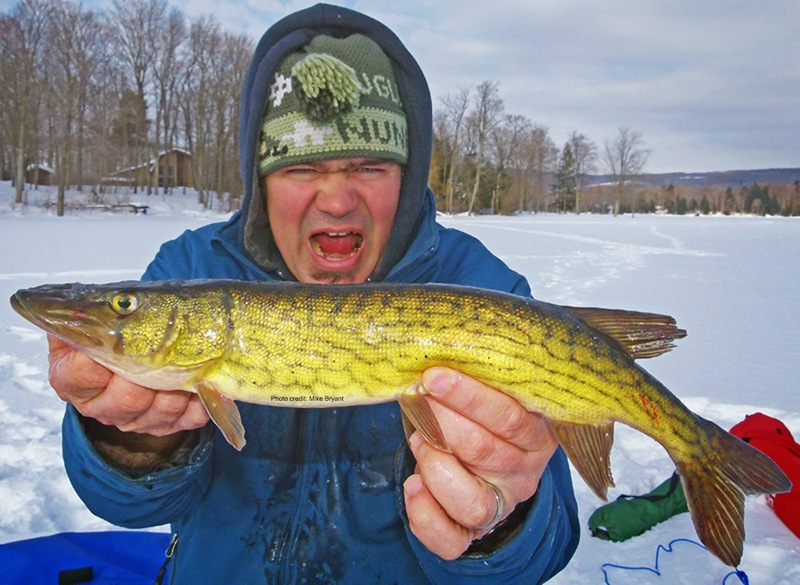 Here it was...a Chain Pickerel often associated with warm, weedy and often boggy waters next to a Cisco that resonates with cold, deep and crystal clear waters. It really makes no logical sense why these two should be found in the same lake, irrespective of our ability to catch them from the same location less than 10 feet apart! Before the afternoon fury finished, I would get one more hit on the set line. This time, the fish cooperated and finally Ethan was able to check the Chain Pickerel off his list! Right after this fish, the weather changed completely. The wind picked up and it started snowing. The bite stopped completely and it was close to 3pm and we decided to call it a day. Initially, we had hoped to fish with Eli and Mike the next day as well, but Eli had a list of spring chores to finish. In the end, Michael and I drove back to Toronto that afternoon and got an extra free day for the weekend.